Is olive oil good for you? You probably have some gathering dust in your kitchen pantry. It’s a staple at Italian restaurants and the average person in Greece consumes more than 24 litres of it every year. So, what makes olive oil so special? Most people think oil = unhealthy, but if that’s the case, why is the Mediterranean diet considered one of the healthiest in the world? According to the Mayo Clinic, the Mediterranean diet reduces the risk of heart disease and cancer. So it could be time to stop thinking of olive oil as an indulgence. When buying olive oil, most go straight for the ‘extra virgin’ type, even though most of us don’t really know what that means. With ‘extra light’ available as well though, are we choosing the right olive oil? What’s the difference? Read on to learn how olive oil can be a healthy part of your diet, and how to choose the best olive oil for you. Olive oil is a fat made by pressing whole olives. Olive oil has been used in Mediterranean cooking for thousands of years, and remains a staple in kitchens all around the world. What types of olive oil are there? Extra virgin: This is the highest grade of olive oil, made only through mechanical means (e.g. pressing) with no chemical processing. It’s considered to have the best taste. Virgin: This is also made only through mechanical means, but has a slightly lower quality. It’s usually sold mixed with refined olive oil as a blend, or is itself treated to become refined olive oil. Refined olive oil: This is made from virgin olive oils using charcoal and other chemical and physical filters. ‘Pure olive oil’ or ‘olive oil’ products are usually mostly refined olive oil, with a small proportion of virgin oil. Light: This doesn’t refer to calorie or fat content, but rather taste. Light and extra light olive oils have a milder, gentler taste. Cold pressed: This means that, during processing, the oil was not heated over a particular temperature (usually around 27°C), meaning that more nutrients are retained and the oil is subject to less degradation. The regular process of extracting olive oil uses heat to increase the volume of oil extracted from the olives, but this sacrifices some quality. You can also buy infused olive oil, which carries the flavour of the herb or flavouring. Popular infused olive oils include garlic, chilli, onion, lemon, and mixed herb. These can add an extra spice or tang to your cooking or salad dressing. There’s a common misconception that oil is bad for you. However, that’s not always true. It depends on the type of oil. Olive oil is a very healthy type of oil, as it mainly consists of monounsaturated fatty acids. These are a good dietary fat which can lower cholesterol and help insulin and blood sugar control. Virgin olive oils are considered the best for health, as they retain the most of the olive’s nutrients. 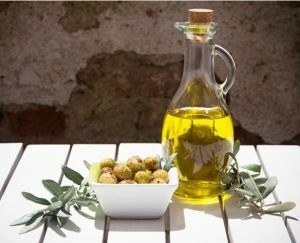 Olive oil is a significant part of the diet of Mediterranean peoples, which studies have shown produces a lower risk of diseases such as cardiovascular disease and some types of cancers. However, it’s important to note that while it’s a healthy fat, olive oil is still high in calories, so don’t go drinking it by the glass to ward off heart disease. How much does olive oil cost? What can olive oil be used for? There are plenty of uses for olive oil that you might not expect. Below are just a few, but explore your recipe books and recipe websites to discover more things you can do with olive oil. Cooking: Despite a common belief that it’s unhealthy to heat olive oil, there is actually little evidence of this. You can generally use it like any other cooking oil to fry, saute, or oven roast anything you’d like. 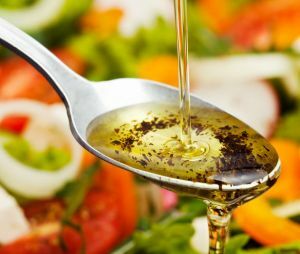 Dressing salads: Olive oil is a great base for salad dressings, as it carries a distinct but not overpowering flavour (when used in moderation) and can easily carry other ingredients mixed in. Marinating: Olive oil soaks well into food being marinated, so can be a great base for your home-made marinade. Dips: Olive oil is a key ingredient in hummus, and can be used to add a richer flavour and texture to many other dip recipes. Baking: You can substitute butter for olive oil to reduce the amount of saturated fat and remove cholesterol from your baking. The lighter-flavoured oil is better for use in baking, so the flavour won’t overpower the rest of the ingredients. Olive oil is also used in cosmetics and soaps, but usually uses a different, inedible grade. Oil sprays are a handy way to coat pans and baking trays to prevent sticking, without making a mess or using too much oil. 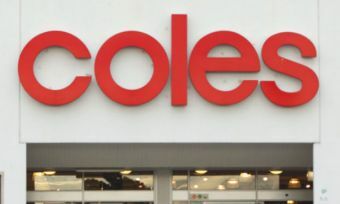 It’s also quite affordable, with prices in supermarkets ranging around $1.33 to $2.99 per 100g. Should I use olive oil? Olive oil is a great choice for healthy oil. It has more flavour than other healthy oils like canola or sunflower oils, which makes it great for salad dressings and Mediterranean cooking. However, if you need a neutral-tasting oil, it’s better to look elsewhere. It also has a lower smoke point than other common cooking oils, which means it starts degrading at a lower temperature. This isn’t a health problem as such, but it does degrade some of the omega 3 content and can affect the taste. So olive oil isn’t a great choice for high-temperature cooking such as frying. The healthiest olive oil is extra-virgin, and cold-pressed if you can get it. 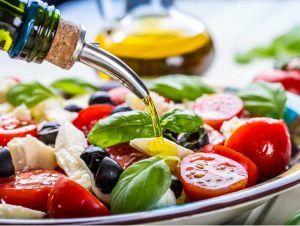 There’s a wide range of strengths of taste among olive oils, so consider your tastes and the kinds of dishes you intend to use it in to make the best choice for you.